I discovered this one by mistake yesterday and thought it would be good to share. 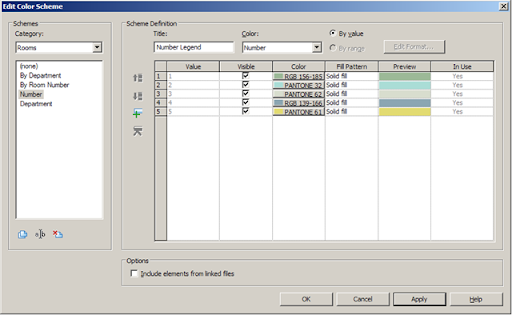 When working in the edit color scheme dialogue it is now possible to zoom in and out of the scheme definition window in Revit Architecture 2009; it is not possible in Revit Architecture 2008. All you need to do is place your mouse pointer in the scheme definition window part of the edit color scheme dialogue, then hold down the control key on your keyboard and then use the middle mouse scroll wheel. 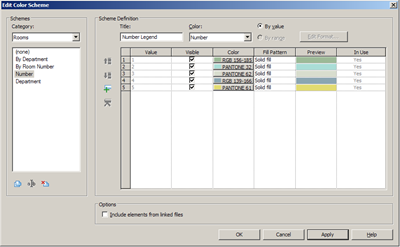 On doing this you will find that you can scroll in and out, to view more or less of the values in the scheme definition. 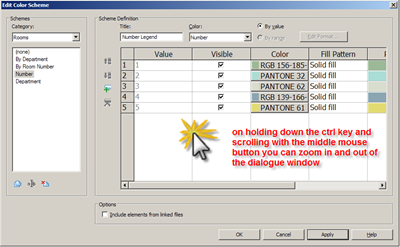 This works on the View Properties dialogue box as well. I'm trying every dialogue box to see what else works.